Summertime is ghost-time in Japan. It’s time to tell scary stories in order combat the summer’s heat with the cold chill that only ghost stories can bring. This story is a version of the Ogre of Rashomon as the story is named in Yei Theodora Ozaki’s Japanese Fairy Tales. I however refer to the titular creature as a demon based on the Japanese word “oni” which is demon/devil. Rashomon is a gate that once stood in Kyoto that lapsed into disrepair and became a place of ill repute. According to legend a demon took up residence there and snatched up passer-bys. Eventually it bit off more than it could chew when it tried to grab a samurai. 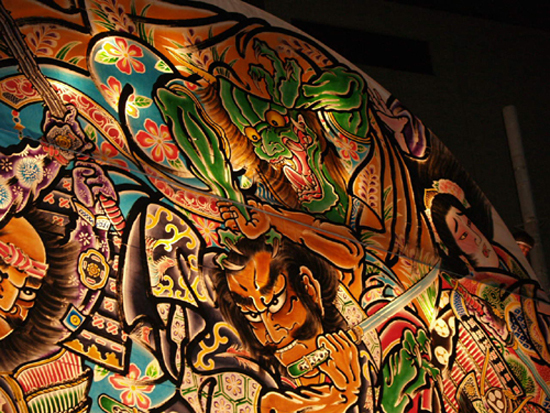 The photos were taken by me of the temple gate of Zojo-ji Temple in Tokyo, a shot of a float from the Nebuta festival of Aomori showing a samurai fighting a demon (Raiko and Shuten-doji), and a depiction of the story on a float at the Neputa Festival in Hirosaki, Aomori Prefecture. The other images are 19th Century woodblock (ukiyoe) prints. I’m a vagabond traveler currently teaching English in Japan. I like travel, history, festivals, culture, and good beer. I’ve been to about 30 countries though some no bigger than a kitchen table. I’ve run with the bulls of Pamplona, hiked the Inca Trail, got mugged in Mexico City, floated down the Nile in old boat, climbed the Great Pyramid of Egypt, got ripped at Oktoberfest, and rode the Tokyo Yamanote Halloween Party Train. Enjoy! Tell your friends, leave comments, better yet leave money! This traveling stuff ain’t cheap even though I travel on shoestring that would barely fit a gnat’s shoe! 2018 Update – I’ve neglected this site for several years after many of my images bit the dust because I was using image bank which apparently went bust and took a lot of my images with it. Will try to update those old blogs as I get to it.